These Grilled Brussels sprouts make a quick and easy camp side dish and are delicious dipped into your favorite sauce or just as a side. An easy and quick camp side dish recipe, great for a crowd or family. 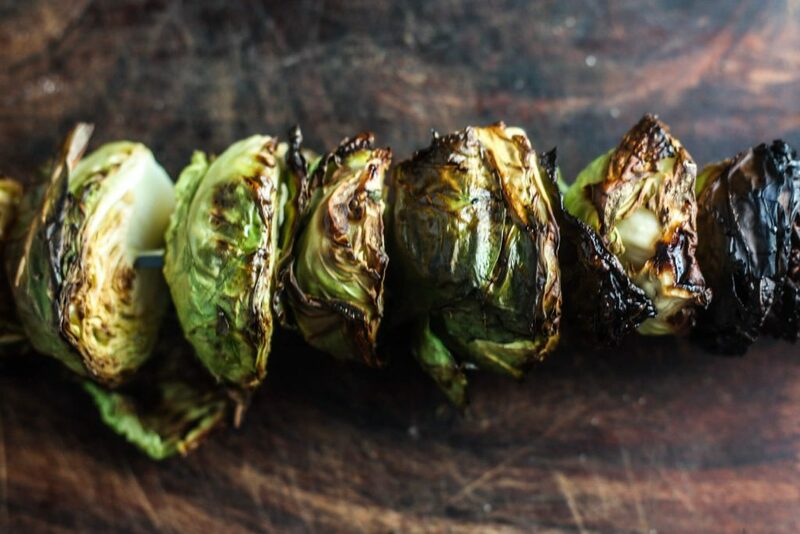 Layer the Brussels sprouts on to a skewer that can go over the fire or the grill (bonus if you can find the Brussels sprouts still on a stalk and use that instead). Rub generously with olive oil and top with your favorite seasonings (I like to use lemon pepper and Himalayan sea salt). Put on the grill or over the fire and rotate every 4-5 minutes until the outsides of the Brussels start to get a nice char. Once cooked, take out and serve with your favorite dipping sauce. You can easily mix up the flavors of these Brussels sprouts by changing the spices you use or the dipping sauces. Some ideas are taco seasoning, smoked paprika, onion powder, garlic powder and dip ideas include ranch, balsamic and olive oil, aioli, bleu cheese, etc.